Six new 2.5 tonnes Vale trailed salt spreaders. In readiness for this season enabling us to cater for all our customer’s winter road and carpark gritting needs we have new additions to our fleet. The additions include one new 7.5 tonnes dedicated grit spreading lorry and one new 18 tonne dedicated grit spreading lorry for the larger sites that we provide winter gritting and salting services for. 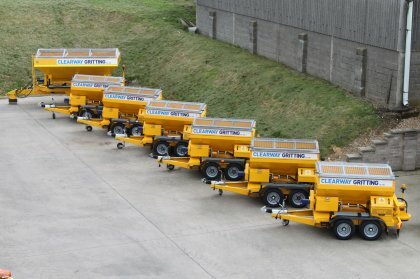 Further additions to the gritting fleet include six new 2.5 tonnes Vale trailed salt spreaders. We have purchased these spreaders as they are tailored to smaller sites enabling us to continue to provide a first class service to all clients with large or small sites.